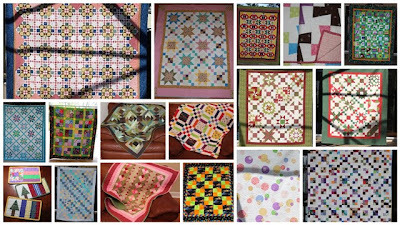 I wanted to wrap up 2010 by making a collage of my finished quilts for the year so that I could update my margins and start with a clean slate for 2011. TaDa! After way too much time figuring out how to make Picasa do what I wanted it to, I have a photo for posterity. Along the lines of technological accomplishments, I've figured out how to schedule a post and have two ready to pop up in the wee hours of the new year. Welcome to everyone who joined in to the Rainbow Scrap Challenge! I tried to list everyone with a blog in the top list in the side margin, so make sure you pop in and see what people are up to. Let me know if you are missing so I can keep the list up to date. Then, at the end of the month you can add a link to your post about all of your fantabulous scrap creations. The first step though, is to go and gather your blue scraps. 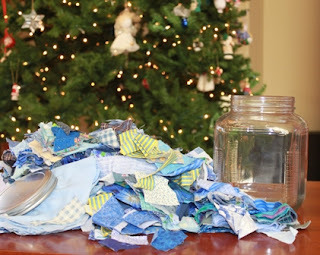 Can you believe that ALL of that came out of my blue scrap jar? I keep strings and crumbs in there, pieces too small to be cut into squares or strips. I'll make sure to do something with those this month. 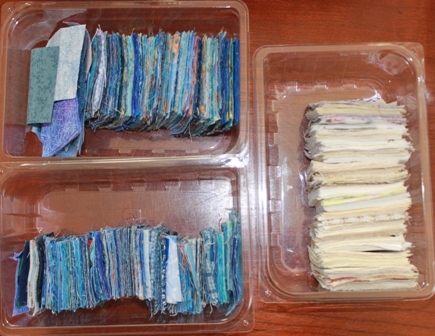 Then I went to the squares drawer and pulled out all the blue squares in 2 and 2.5 inches. I grabbed some white while I was in there because white goes with everything. I've got a couple of ideas percolating for squares. I like to set those up as leaders and enders a la Bonnie Hunter and let them work through between other projects. Finally I dove into the strip drawers and pulled out blue strips in 1.5, 2 and 2.5 inch sizes. I've got some plans for those as well. Tomorrow is the first Scraphappy Saturday, so have some scraps ready to sew. I'll include a variety of ideas for all sizes and types, do as much or as little as you like, but remember, the goal is to use up those scraps, so get ready to sew! Sydney has never seen snow. Not real snow. 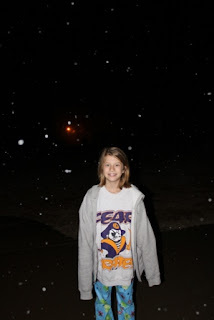 We drove to a ski resort a couple of years ago and they were making snow. Last winter a couple of flakes fell from the sky and she gathered them in an overturned umbrella. But we are in Georgia for Christmas and it is snowing. Real flakes that are sticking to the ground and covering it in glimmering whiteness. For most of you I'm sure it seems silly to be excited about a bit of winter weather, but for our native Florida children it is a magical treat. It is the first time they have ever had a white Christmas. We had our own family celebration yesterday. We have never spent a Christmas day at home. Santa is nice enough to come a day early though. He is very accommodating that way. We have all the same rituals and traditions, just a day earlier than other people. 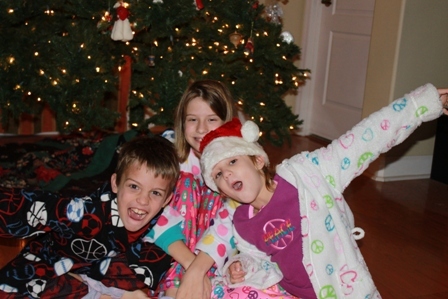 So we put out the milk and cookies and modeled the new Christmas PJs. We listened to Christmas music and Christmas stories. I don't think we'll have another Christmas with the magical believing still going on. I'm savoring it while it lasts, like the last bite of a dessert so delicious you are tempted to lick the plate clean. After that it was a short 7 hour drive to Georgia. We have had a lovely day spending time with our cousins, sharing meals and opening gifts. Each time they see each other the kids jump back in and start playing as if they had seen each other yesterday instead of months ago. Ryan and Austin are so close in age and interests and Paige and Sydney are just as well matched. Anna and Zach make an odd set of solo book ends on either end, but they find their own amusements. 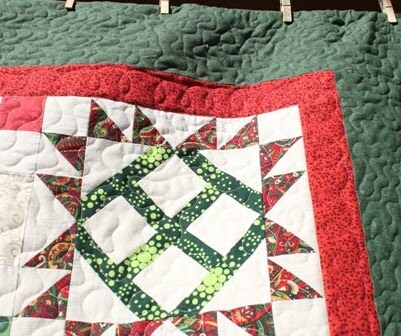 I brought three Christmas quilts to give as gifts. 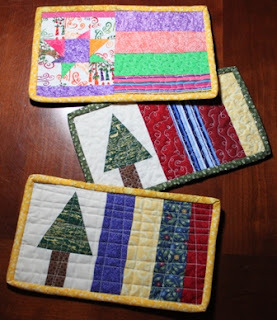 The Christmas twin block of the month samplers went to Mom and Tom while the Christmas Lights mystery quilt went to my sister and her husband Scott. The kids each got a homemade snuggie, I'm wishing right now that I had made and extra for me. I am starting to remember how cold snow is. I'm working hard on updating my blog and getting all the code right. I think I figured out how to make a "grab by button" thing thanks to http://bloggingwithsuccess.net/tutorial-grab-my-button-one-click-install. If someone would be kind enough to test it out for me and let me know that it works, I would be much appreciative. If you are new to the challenge, please check my links and make sure yours goes to the right place. If you on the no reply list, I am missing a blog to send people to. Send me your link if you have a blog and I'll switch you to the other list. Also, let me know if you are missing. I'm making my list and checking it twice, I'd hate to leave out anyone (naughty or nice). I couldn't finish Freddie without getting an official parting photo. He was much more cooperative than his twin sister. The blocks were all happy to lie flat and I found thread colors that came closer to matching. I just need to cut out the binding and all will be well. This was my favorite of all of the blocks. 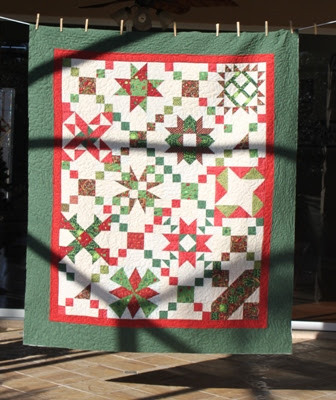 It is called Mosaic Star and it is from Grandma's Best Full Sized Quilt Patterns. I made it on February 19th. I love having a blog so that I can go back and find out things like that. I would love to make a whole quilt of just this block. While going back and looking for the block name I realized that I had posted the wrong button in my margin. I had made one with 2010 as the year by mistake. It is fixed now and I'm off to figure out how to make that cool html "grab this button" code. Also, for the person who asked where I got my cool looking "antique" jars, I found them at Wal-mart last Wednesday. They are large cracker jars and I had to go back twice to get enough for the whole rainbow. I know, things are pretty fancy around here. This afternoon I'm going to get out my scraps and start playing so I'll be ready with lots of brilliant ideas on January 1. I'll be revealing the new color on or around the first of each month, though I've already let it be known that January is going to be blue. Now I'll see if I can figure out how to make everything on my blog blue! I just pulled Freddie off the frame. He is the second of my fraternal Christmas twin quilts. I worked on him in bits and bursts all day. You know the routine, cut out a border, unload the dishwasher, pin it on, start the laundry. Ryan had a friend over from the Lego team and they worked on Robots. Sydney had her last day of basketball and Anna played with a friend. In the afternoon, the neighborhood kids all started the typical ringing of the doorbell and cruising of the block to see who could play. The number of kids is one of the things we love about where we live. This evening we were invited over for cake and punch by another set of neighbors. 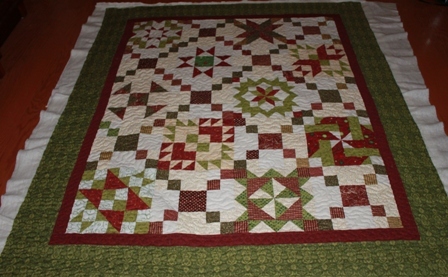 It's been a very nice day, and finishing of my last Christmas quilt was the perfect end. It looks like tomorrow will be all about binding. I haven't been able to get near my computer all day (who new I would be fighting for screen time with my 9 year old). It looks like there are lots of new names for the scrap challenge. If your name isn't coming up on the list yet, it is because you are coming up as no reply. I can start a no reply list, but the one I have going so far is a list of links that go back to blogs. Of course you don't have to have a blog to play along, but an e-mail I can reply back to would be good. I was so happy today to have the sewing day that I had been looking forward to. I was tempted to stay up until the wee hours last night and take a look at the lunar eclipse, but knew it would have left me lethargic all day, so I got an early night and was up sewing bright and early instead. Kurt was nice enough to help with the driving around today which left me plenty of time to sew myself silly. He even made it home early and we all went out to dinner to the kids favorite Chinese buffet which had been closed but is now open again under new management. After that we drove to look at some Christmas lights. 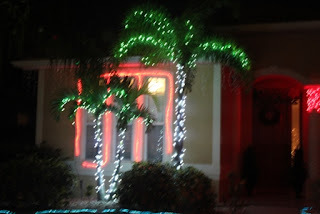 I firmly believe that Christmas lights just don't look right hanging on palm trees, but it's what we've got. One of Kurt's friends from work did a big fancy display which is synchronized to music he broadcasts on a special radio frequency. Sydney thought it was truly awesome. She is at one of those fun stages where everything makes her happy. Anna thought it was a really geeky thing to waste time on. She is at the age where everyone is lame. Now I'm sitting here with a freshly finished quilt starting on the hand sewing of the binding. I'm always tempted to sew the binding down by machine, but it is such a joy to sit and admire a new quilt while sewing the edges down. I like to check for stray threads while I sew. It gives me and excuse to watch lots of movies and relax for a bit. What could be better than that? I am so excited about all the people jumping in to the Rainbow Scrap Challenge! 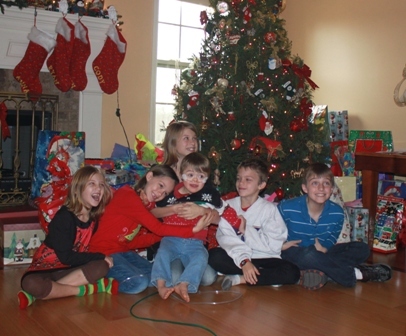 I wanted to take care of a few housekeeping things before we get started in 2011. 1. I have a list of colors for each month of the year. Would people like to know now so that they can plan or wait to be surprised at the beginning of each new month? 2. I have a list of patterns, ideas and plans which I will to release on a regular basis. 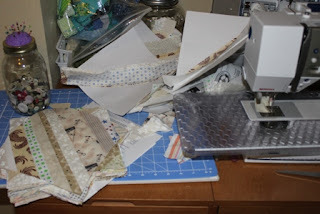 I am thinking of posting scrap related inspirations on Saturdays and calling it Scraphappy Saturday. Or maybe Superscrappy Saturday. Some weeks I'll put together a tutorial, and sometimes I'll just post photo or a link to something that has already been done. In any case, you are welcome to use as much or as little of what I post as you like. Feel free to use a different color or a different idea. Remember, no quilt police, no rules, no worries. 3. Please check my list and make sure your name links back to your blog (if you have one). This will help other people visit and see what you are up to. Let me know if you would like to be referred to as something else or if you'd rather not be listed at all. I hope I haven't left anyone off (gasp), so if you seem to be missing from the list, please let me know. I'll fix it ASAP! 4. Make sure I have some way to get in touch with you. If you don't have a blog, an e-mail will work. I am getting a few comments that show up as no reply. So Sue P. and Just one More thing, I got your responses but can't reply back to you. 5. Although I didn't figure out how to do the nifty html blog button thing, several people have let me know that they just copied the picture and then linked it back to the original post. So if you are joining in, feel free to save the photo and then link back to this post: http://superscrappy.blogspot.com/2010/12/rainbow-scrap-challenge.html. I've been calling these two quilts the Christmas twins, so as I was thinking about famous twins. Mary Kate and Ashley just didn't seem right to me. 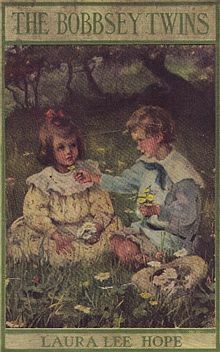 Instead I thought about the Bobbsey twins. I couldn't remember their names though, so I googled it. Turns out there were two sets of fraternal twins, the older ones were Nan and Bert and the younger ones were Flossie and Freddie. So I'm calling Christmas twin number one Flossie. I decided to do a simple meander with cream thread in the middle. I know other people have huge thread collections and lots of options, but I only have a few choices so far. 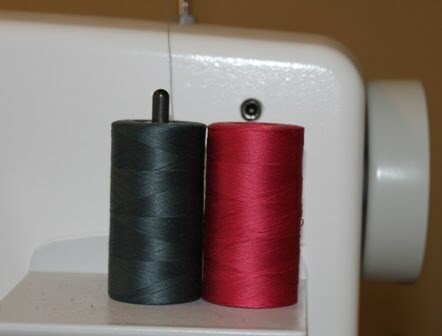 I was planning on using red thread in the red border and green thread in the other. I couldn't find those so I chose some pink and blue instead. It seems to blend in well enough to me. Once it was on the frame it didn't take long at all to get quilted. The center section took an hour, and then I had to change the thread for the borders. I'm not sure what the proper method is for doing the borders. After doing the center I switched thread and worked my way across the bottom, up one side, across the top and then back down the other side in the inner border. The top and bottom were easy enough, but I had to keep advancing the quilt while doing the sides. Then I switched the thread and did the same thing all over again for the outer border. Even though it seemed tedious, I guess it couldn't have been that bad, because I was done by the time I needed to get Sydney from basketball camp at 2 and I didn't start until after we came back from the vet and ate lunch. Now, on to the second twin. It will be called Freddie of course and I think it has better behaved blocks than Flossie did. 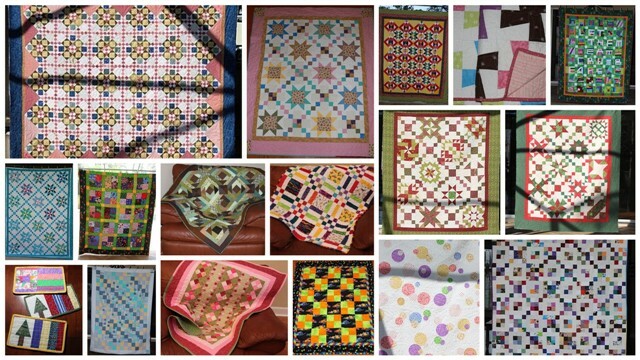 Most of the blocks I ended up wanting to make more of were in the second quilt. Back to borders I go! I've got lots of Christmas movies recorded so I can do some binding tonight. I would have loved to stay in my jammies all day and quilt like crazy in celebration of the first real day of Christmas break. However, it was not to be. There was a lot of driving and dropping off and waiting. Sydney loved basketball camp. She did a reenactment of a sharks and minnows game over dinner that was quite amusing. Ryan did a terrific job during his Lego Robotics team Skype interview with the pediatric Celiac specialist. Mostly he just enjoyed playing with other people's Lego Robots though. Anna had a great time at her ice skating party. Dad did pick up duty and she showed him the shoot the duck move she has been working on. Amongst all of that we were home long enough to eat lunch, sweep the floor and fold a load of laundry. I think tomorrow will be better, just basketball and a trip to the vet. I'll have to put on real clothes for those, but I should have a little time to sew. 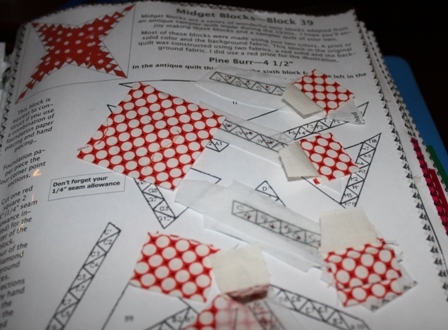 As soon as dinner was cleaned up and the kids were settled into bed I started cutting out the borders for my twin Christmas quilts (they are fraternal, not identical). 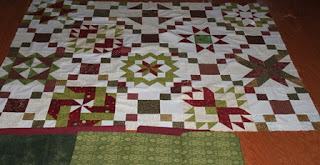 The bright quilt is now bordered and ready to go on the frame. I picked out some flannel to try on the back. It feels SO soft. 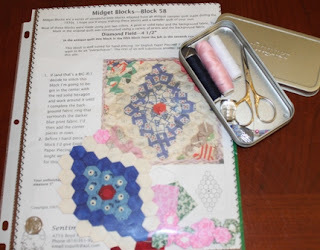 I loved making new blocks each month and quilting along with everyone else doing the Amy's block of the month. I tried out some new patterns and found a couple that I would love to make into an entire quilt. There was only one block that I wanted to toss out completely. If I weren't so stubborn I would have replaced it or redone it so that it was somewhat close to the right size or at least flat or a little square. I now remember why we don't all use templates anymore. It was called Florida Star though, so I think I had to keep it. I am amazed that I managed to get it sewn in and bordered without any puckers, but I'm still wondering how it will ever lie flat. 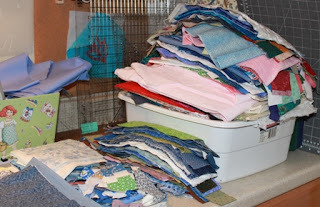 My plan is to quilt it into submission. Now I'm sitting here debating putting the first border on the other quilt versus going to bed. I think bed is going to win. 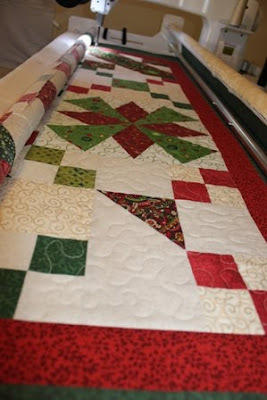 It is getting very close to Christmas, which means I need to get moving on these Christmas quilts. 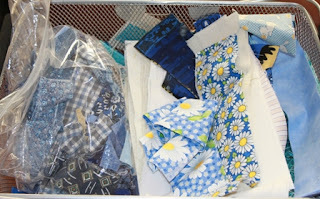 I went out yesterday to get some options for border fabric. There is quite a bit of green in my stash, but very little in the red range. 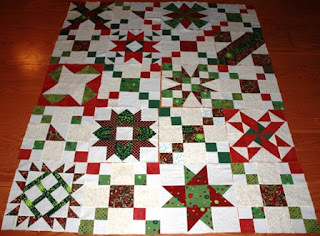 I thought that I could use whatever doesn't go into the Christmas quilts in the next step of RRCB. 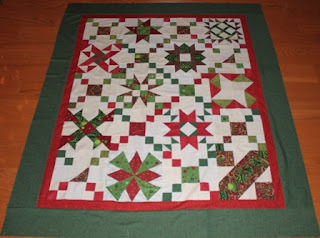 I think I'll do a 2 inch red border surrounded by a wide green border. Thanks Amy for organizing the Block Of the Month. It was a lot of fun, and I got two quilts out of it! I thought it was going to be a nice quiet day at home for the first real day of winter break. Instead, Sydney has basketball camp from 10:30 to 3:30. Ryan has Legos at 11:00 and Anna has theater on ice at 4:00. Not exactly a nice quiet day after all. I think I managed to work in the orthodontist and vet later this week in case we were getting bored. 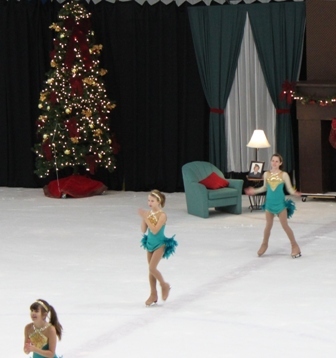 Thankfully though, the Ice Skating Christmas Show is OVER! The girls had fun, but they are both pretty happy to be done. There isn't any regular ice skating until the new year, so they can all take a little breather. Now, I'll go see what everyone else is up to in Design Wall Monday before I start my day. I've been waiting to see what I finish this year before I start to contemplate my UFO list for next year. Eventually I decided to just make the list as it stands now and replace anything that gets finished with something else. I'll get things crossed off the list one way or another. 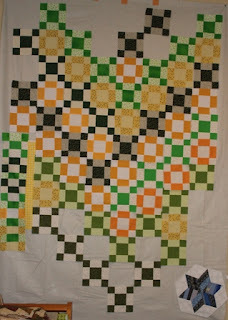 The blocks were all put together and I was ready for borders when I decided it needed to be bigger. I've got the extra blocks made, I just need to incorporate them into the quilt and add a simple border. 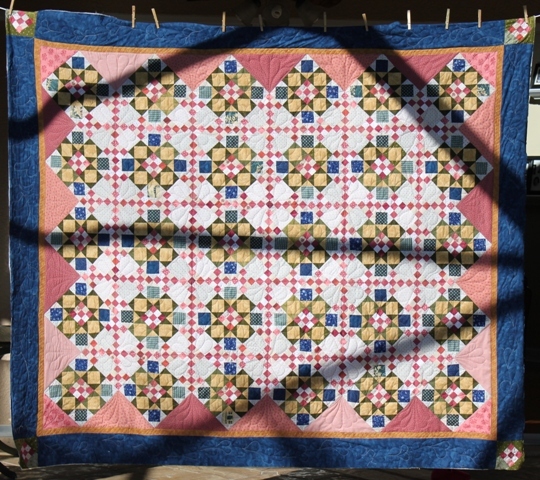 This was an experiment with Bonnie Hunters Carolina Chains pattern that grew into a quilt top. I think it needs a small border but it is already hanging with backing fabric. This one has one border but I was waiting for the right shade of blue to add a second border. It is going to be hand quilted. 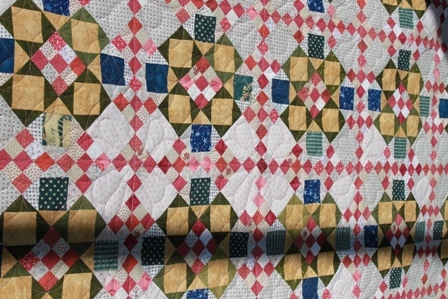 I've been busily hand quilting on this one, but I'm not sure how much longer it will take. This is for Anna. She is desperate for me to finish it up. The blocks are made, they just need to be put together. Nothing is standard sized, so it will need a lot of puzzling and deciding along the way. I've just started this one and I am liking it a lot. I've got most of the blocks made. It just needs a little time. It has fallen off the list temporarily because nobody is waiting for it. Not sure if I will get these done in time for Christmas. I'm off to find some border fabric this morning. Ryan and I are going to "do lunch" while the girls are skating. After this is it starts to get harder. Active projects and experiments start to get included as well. I am working away at step 3 and 5 I think. I'll let this one rest until after Christmas I think and then get caught up again. I almost forgot about this one. I worked my way back to November 8 in my blog to find it. I've got the top put together but need to start working on borders. 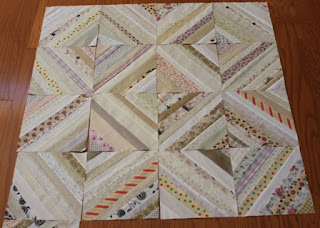 It is going to have a complicated series of pieced borders. This was an experiment I was working on. I need to either finish it or get rid of it. I was just playing one day and accidentally started 3 new quilts. Oops. This was on my UFO list for last year as well. If it doesn't get finished soon I'll just give up on it. People are starting to sign up for The Rainbow Scrap Challenge! I'm sitting down tonight to figure out how to make a "button" that you can put on your blog that will link back to the challenge instructions. I've seen it on other peoples blogs, surely I can figure out how to do it. I'm working through ideas and collecting thoughts about different ways to use scraps. 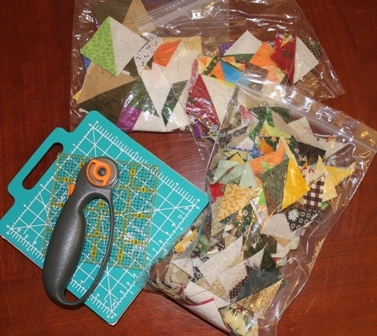 I'd like to post a new idea every week that involves that month's color of scraps. Please make sure if you join in that I have some way to contact you. Most comments have links back to blogs or e-mails, but Heather who doesn't save her scraps (gasp!) came back as no reply. OK, last post for the day, really. 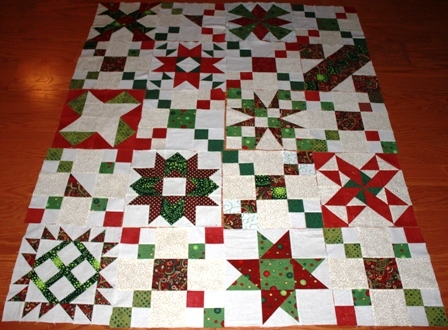 I just got the two tops together for the Christmas BOM quilts. I don't have much for borders and backing though. I feel a need to shop. Unfortunately, the ice skating show starts at 4, so the girls need to be there at 3:15, it takes half an hour so we need to leave at 2:45. Yikes, I'd better get moving. I've got the binding ready for hand sewing on Double Delight. It will keep me warm and busy while I wait for the show to start. Can't ask for much more than that. Several people have wondered how I manage to get so much sewing done at the ice skating rink. I thought I'd take a few minutes to share a couple of my "sew on the go" strategies. First, always have something sitting in a bag and waiting in case you have to dash out the door unexpectedly in order to sit and wait an extended period of time for something or somebody. Examples from my own life include doctors, dentists, rehearsals, practices, car lines and long car trips when someone else is driving. Simple hand work is the most dependable kind of work to do while out and about. You don't need a table or a lot of equipment, especially if everything is prepped ahead of time. I can store needles, pins, scissors, thread and a thimble all in the tiny tin that my scissors came in. It doesn't take up much space at all and it stays ready to go. I've also made up a tiny sewing kit in a film canister with several bobbins full of thread, a thimble, a thread cutter and a few pins and needles. Grandmother's Flower Garden is a classic hand sewing pattern. Any kind of applique is a good choice. English Paper piecing would be perfect as well. I try to avoid starting a new project just so I have handwork, but I do scan ahead in my ongoing projects to find the parts that might best be done by hand. I spent quite a bit of time this summer working on embroidery and crochet, but I found that I didn't stick with them over the long term. There are a lot of places that I have to go and sit where I know I will have a table or counter available for workspace. Gymnastics and ice skating both have snack bars with tables. Our own pool area has one as well. If I'm at the rotary cutting point in a project, I make sure I've got a small ruler and cutter in a bag with a small mat. My cutting mat is actually part of a bigger mat that got broken. I cut it apart to make several smaller sized mats that I can keep ready to go. This is my favorite take along project because it is ongoing and never ending. I always "sew behind" on any flip and sew triangles and save the half square triangles to use later. It is a long and tedious project, which makes it perfect for filling those off hours of idle time. I use a tiny ruler and cutter along with this cute little two sided mat. I also have some plastic templates that I use to trim them by hand in case I don't have a work surface available. Sew, if your want to sew more on the go, (sorry) just think about what you can get set up and put into a bag for the next time you have to rush out in order to hurry and wait. It is amazing how much you can do while everyone else is sitting around being bored. Feel free to skip this post. I've been living at the ice skating rink lately though and I thought I should post some pictures of the girls during their dress rehearsal. 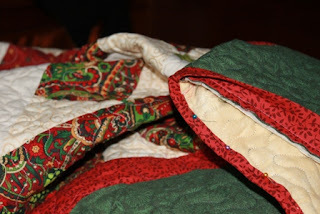 My mom reads my blog and zooms past all the quilt talk in order to find pictures of the kids. 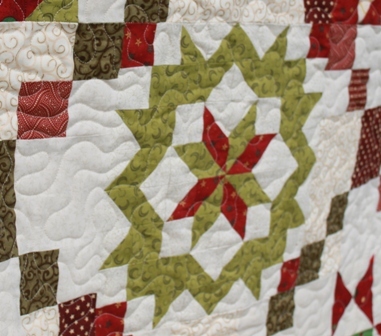 I'll do a quilt related post next -- promise. 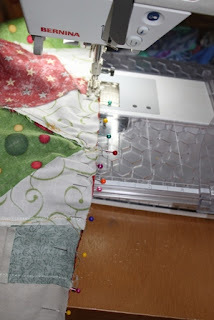 Then all my non quilting readers can zoom past that to find the other stuff. This in Anna in her feather bottom costume. It is somehow supposed to relate to Christmas in the 1940s and has something to do with World War II and and Andrews sisters. There is quite a bit of plot woven into the show somehow. Sydney was a snowman in her first number. Frosty had some sort of altercation with the Abominable Snowman centered around a magical snow globe. 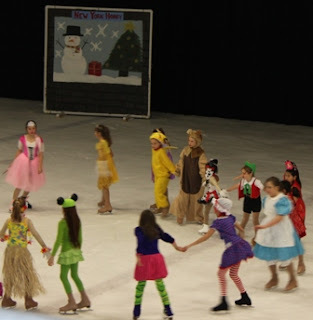 This is one of Anna Theater on Ice numbers where all the toys come to life. 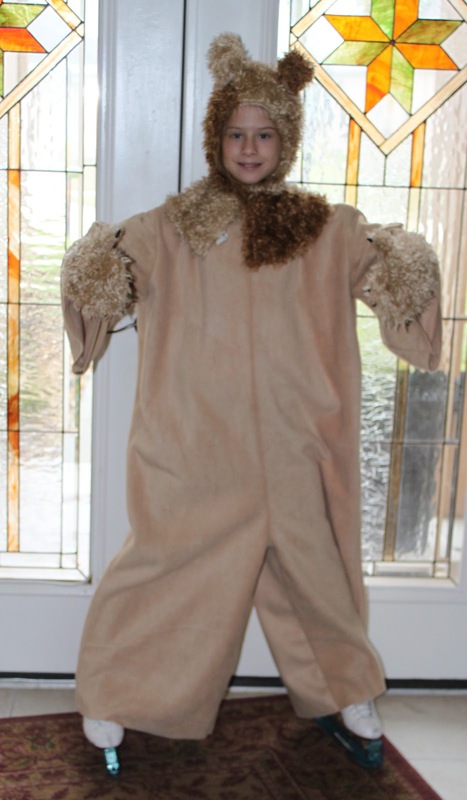 See the giant teddy bear costume? She likes it because it keeps her warm. OK, I think that's enough of that. I took about 200 pictures, but after a while they all start to look the same, even to ME. I got a late start on Friday night sew in. Kurt was taking girls to their first actual performance of the ice skating show so I went to go hang out with Ryan. 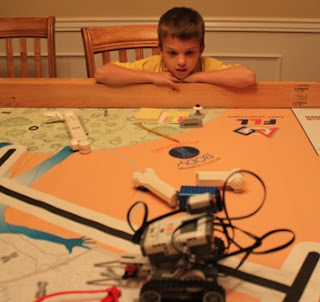 We brought the Lego Robotics board home for the holiday and he spent most of the afternoon and evening programing and running trials. I don't know much about the programming language he is using, but I can certainly offer advice on scientific method and problem solving strategies. He had his robot successfully putting a cast on a broken bone before he did something to merge the program and messed it up again. I'm sure he can get it fixed again tomorrow. It should be a very calm home day. So as soon as he was off to bed I jumped back in to my Christmas BOMs from Amy. I had all the sampler blocks made but was still in the process of finishing up the chain blocks when it got put away last time. The first one is the bright version. The second one is the more muted combination of colors. I got some fabric for the border, so now I just have to decide whether to find the energy to start webbing the top now or wait for morning. While everyone is getting ramped up for Judy's UFO challenge for 2011, I am still trying desperately to finish off a few more from Nancy's UFO challenge for 2010. Double Delight has been in progress for quite a while. It was one of Bonnie Hunter's mystery quilts and I was so happy with the way it turned out that I didn't want to do anything to mess it up along the way. I finally decided to take a deep breath and jump in. Continuous curves grace each of the yellow and green square in a square units and a very odd feather flower looking thing is in the double nine patches. I attempted some feathers with blue variegated thread in the borders. I'll just call that a learning experience. I need to do a little reading on the best way to do borders on a frame. 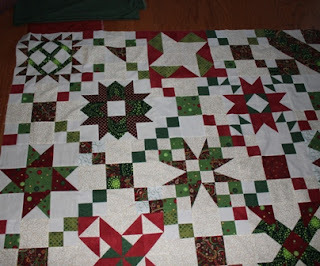 I ended up quilting the top and then working my way back down one side, across the bottom and up the other side. I'm not sure if that was quicker than taking the quilt off and turning it, but it's done now, so I'll think about it some more later. For now, I've added a binding that matches the gold inner border and I'll sit to sew it down when it gets calm. I'm not sure whether calm is going to happen anytime soon. The kids are now officially on winter break so we'll all be bouncing about the house together for the next couple of weeks. I've been seeing lots of really cute mug rugs on other people's blogs. I kept thinking it would be fun to make a few for gifts. Most people are smart enough to start on handmade gifts a little bit earlier. I bought some mugs to go with the rugs and I'll fill them with tea or coffee or hot chocolate. First though, I'm headed to bed, I've finished giving and grading my last final, but I've got a conference scheduled for tomorrow, so I still have to go in to work at some point. After that I'm going to sew myself silly though. That's my plan and I'm sticking to it. Now is the time that people to start making plans for the new year. In honor of fresh starts, I am organizing a challenge to encourage people to use their scraps. One color theme will be presented each month along with some ideas for using scraps in fun and new ways. I am inviting anyone who would like to play along to try these ideas or some of your own. The plan is simple: comment to let me know that you want to participate in the challenge and I will start a list in the side margin. 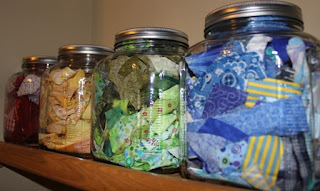 Each month will bring a new color or theme along with some ideas on how to use scraps. At the end of the month, let me know what you have made. I will put up a Mr. Linky box so everyone can come by and see your scrap creations. Already participating in another challenge? Not a problem, feel free to deviate from my colors. Don't have any scraps of a particular color? Of course you may substitute and change things up to your hearts content. No rules, no quilt police, no worries. The goal is simple, to use more scraps by focusing on a single color each month and using it to try out different scrap friendly projects. You can work on a series of small projects or create individual blocks to go together into a single quilt at the end of the year. The choice is yours. How do you get started? Go find some scraps. Collect them together and start sorting. We'll be using a particular color or combination each month, so the easiest way to start is to separate some of your scraps by color. Don't feel like you need to overhaul your whole scrap organization system, just collect together a nice little assortment. Put it in a bowl or a bag or a jar. January is going to be blue, so you can start by looking at your scrap basket, box or tub and pulling out some blue. Crumbs, strings, strips, leftovers, it's all good. Just find something blue. Then leave me a comment and I will start making my list and checking it twice. I'll even figure out how to make a nifty button that links back to my sight. I think I can, I think I can. I made a valiant effort to finish off the next Midget block in honor of tiny Tuesday. I got out the foundation pieces and marked the red parts, I cut some little squares fabric and even got the first couple of sections sewn onto each of the 8 sections. Then it was dinner time and we ended up going out. Dinner was right next to Joann's, and they still have polar fleece on sale. I was checking out this tutorial for kids snuggies today and thinking about making a few for Christmas gifts for the kids. Sydney goes crazy every time she sees the commercial and SO DESPERATELY wants to have a snuggie of her own. I found no sew fleece throw kits at half off that were cheaper than yardage, so I bought a couple to try out the pattern. Maybe tomorrow afternoon if I can finish up with stuff at school. Today was the first day of finals so its crunch time with everything needing to be done right NOW. I've only got one exam tomorrow, so I'm hoping to get some serious work done before the teacher appreciation luncheon. I had an overwhelming urge to start something new this weekend. Not because I had finished anything old, just because I could. It started simply enough. I was sitting at an ice skating rehearsal with my cutting mat and some extra fabric from RRCB step 4. The girls still had an hour on the ice and Ryan was busy playing games on my computer. 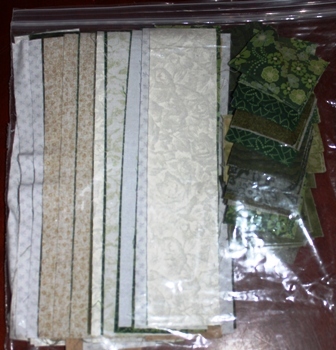 So I sliced up some green and neutral fabric into 3.5 and 2 inch strips. The nice thing about these blocks is that even though they need two strip sets, you use about the same amount of each, making it is easy to plan. I love making nine patches, but its a chore to make matched sets when you need twice as much of one arrangement as the other. When I came home I found some yellow to go along with the green. 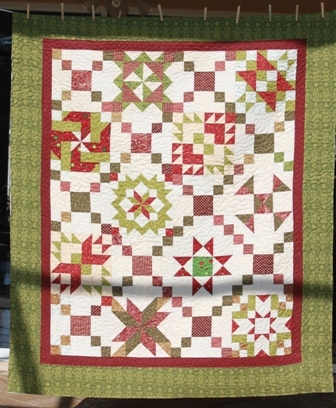 I seriously considered red for a Christmas quilt, but I think the yellow is cheerful. I'm still playing with the layout, it was a straight diagonal at first, but now I'm working on a V like chevron shape. Maybe if it gets big enough I can work on a W or M. Maybe I should do some math and figure out how big I want it to be? Mabye I'll just keep going until I get tired of making blocks. 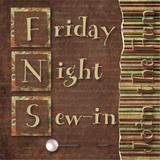 I just popped over to Jill's blog and saw that there is a Friday Night Sew in scheduled for next Friday. What perfect timing. School will be done for winter break and I will be ready to stitch into the wee hours. Having Kurt home again allowed me to take a little time today and just have some fun in the sewing room. What a wonderful luxury it is to take turns carting the kids around town. Yes, I have a bajillion ongoing projects that I should be working on. Instead I started something new. One day last week I had extra green and neutral fabric from RRCB at an ice skating rehearsal along with a rotary cutter and an i-phone. 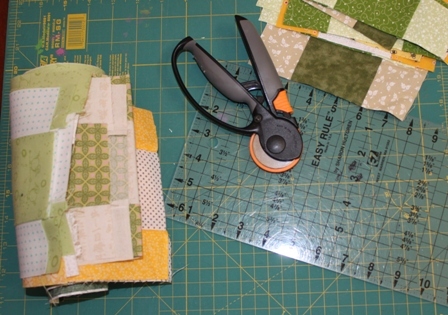 I zoomed over to quiltville and started cutting 3.5 and 2 inch strips for Bonnie's Road to Camp Gravatt quilt. 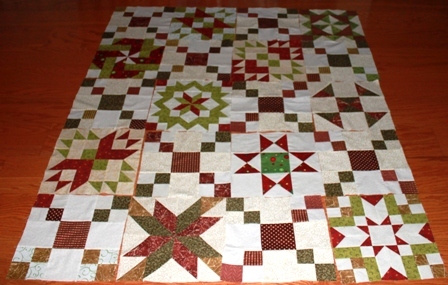 I didn't think I wanted to do the wonky star points in the sashing, but knew It wouldn't work to just set the Puss-in-the-Corner blocks straight together. I considered a simple green sashing strip with a white cornerstone, but decided to use a different colored alternating block instead. I was SO close to doing red and green for Christmas, but at the last minute changed it to yellow and green instead. 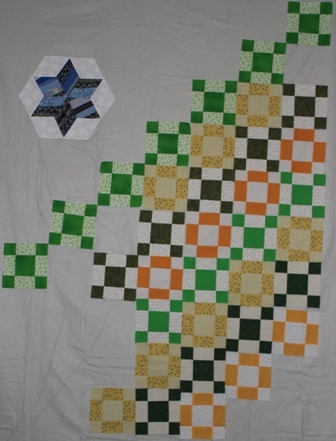 I reversed the color placement in the yellow blocks so that they would mesh nicely with the green blocks. I've got a stack of strip sets ready to go, but wanted to get a few up on the wall to see how the blocks played together. I'm kind of liking it. It isn't a complicated quilt, but I am enjoying the simple geometry of it. It is going to be called Kitty Korner, mainly because I always want to snicker when I have to say Puss-in-the-Corner (or Norfolk Virginia for that matter). Sunday is pizza night, but I should really get everything cleaned up and do some work for school. Midterm exams start on Tuesday and I need to do a final proofreading so that I can make copies. I also want to finish off all the odds and ends of grading so that I can call that officially done. 5 school days until Christmas vacation! I am looking forward to staying home and sewing all day in my jammies. Especially now that I have someone to help me with the rest of the Christmas shopping. I spent the morning working on Anna's teddy bear costume for the ice skating show. I think she has 5 costumes, but this is the only one I was asked to make. I needed to leave the legs big enough to fit over her ice skates, but I might have gotten a bit carried away. I can put some elastic in the sleeves, but I'll have to think about what to do with the legs. It still needs a tummy and some velcro in the back, but I'm not going to get too carried away for an outfit she's going to wear for 10 minutes during each show. This afternoon I spent some more time working on RRCB step 3. These string blocks are taking a REALLY long time. On the bright side, I did finish with step 4 at ice skating practice this morning, so I feel like I have the rest of the week to work on step 3 and I still won't actually be behind. Strange logic, but it works for me. Kurt is almost as happy to be home as I am to have him back. I just drove over to the airport to give him a car key because his were in his luggage which is still in London. It's been 45 hours since he first got on a train to go the airport. I think a good nights sleep in his own bed will do wonders for his disposition. Then in the morning we can coordinate our schedules and figure out who gets which activities. I used my unexpected down time this morning to work on some more string blocks. I felt like I was getting lots done, though only 16 seem to have come out at the end so far. 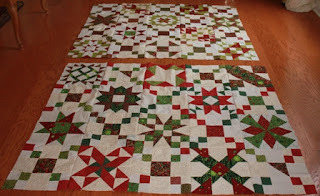 I think they look very nice so far, but I have no idea how they will fit into the finished quilt. Then I took the fabric for step 4 to ice skating this evening to get the cutting done. That didn't take the 3 hours we were there, so I looked up another pattern on Quiltville and cut out the pieces for The Road to Camp Gravatat as well. If I can get them sewn in the morning I can take them along wherever I end up and do the subcutting. It's been a long and painful week, so I think I'll head to bed. Goodnight all.